Meet Kyle, Anna, Rowan, and Briar. We are a team that is commited to growing quality, healthy food for you. For the past 5 years we have been farming a large variety of vegetables on 2 acres in North Tetagouche. We are a family that loves everything about food; sowing the seeds, nurturing the plants, harvesting, preserving, cooking, and sharing all of it with others. We are very excited to provide you with fresh local food this summer! At the market: You can find us at the Studio 2 Market in downtown Bathurst on Saturdays from 9-1. 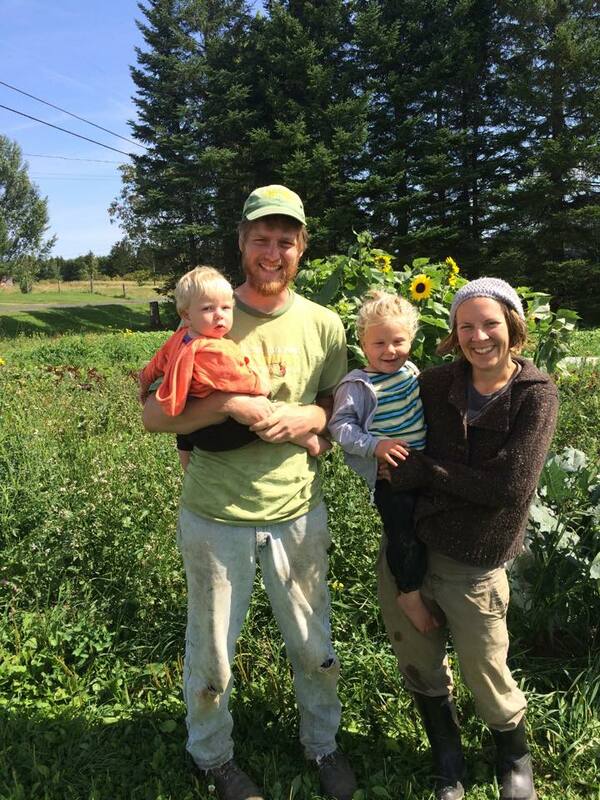 Community Supported Agriculture: By signing up at the beginning of the season, you can be a part of our farm and receive a weekly share of the harvest! We are currently taking names and will have more information in March. Check out the CSA tab for more info! We encourage you to come and visit us and be a part of the food you eat! Please call us to arrange a visit. See you next summer! Very excited…it will a first experience for me and I am looking forward to it. Very interested in home grown food. Would like to access your vegetables and whatever else,like eggs… Will definitely check you guys out at the market .